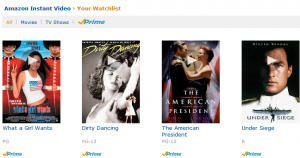 Amazon’s streaming video service added a “Watchlist” feature. If you see something you like in the category “Instant Video,” click “add to watchlist.” Your list of saved titles will be there the next time you visit the page, like a Netflix queue. Many movies are free if you’re a “Prime” member. The bummer is that Amazon videos don’t play on the iPad, because the iPad doesn’t handle videos requiring Adobe Flash.